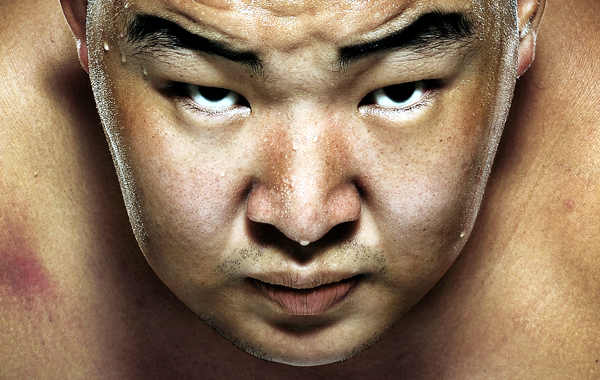 From his winning portfolio, World Games Sumo Champion Byambajav Ulambayar (Byamba), poses for a portrait near Manhattan Beach, California September 26, 2009. Los Angeles-based freelance photographer Dustin Snipes won the title of "2009 SportsShooter.com Photographer of the Year," marking the third time he has won the title. His prize, a Canon EOS 1D Mark III. The "Clip Contest" is a yearlong series of monthly contests in which photographers submit their best photos from the previous month to be rated by fellow SportsShooter.com members. Each month points are awarded to the highest scoring images in four categories: Sports Action, Sports Feature, News, and Feature. At the end of the year all the points are tallied and the member with the highest score is declared SportsShooter.com's Photographer Of The Year. "I never went to photojournalism school," said Snipes. "I learned from people like Donald Miralle, Robert Seale, and Al Bello right here on SportsShooter.com. Those guys were my teachers." Snipes is primarily shooting more commercial and advertising assignments than editorial these days. He's done work for Gatorade, Nike, and Reebok, in addition to ESPN The Magazine. "The monthly SportsShooter.com contest really pushes me to be more creative," he said. "Last year, I didn't enter the contest at all, and I felt like I was lacking creativity. I'm a really competitive person, and I think the contest made me make better pictures." Patrick Smith, a photojournalist at the Provo Daily Herald finished second place in the contest, and wins a Canon ImagePrograf IPF5100 large format printer. Snipes says he was paying attention to Smith throughout the year. 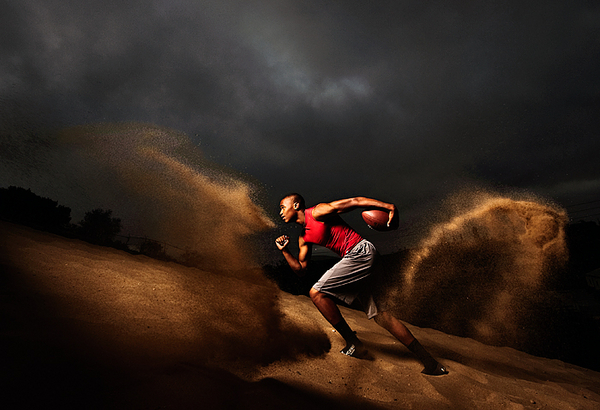 From his winning portfolio, High school football player Robert Woods poses for a portrait at Sand Dune Park in Manhattan Beach California. Woods practices at the park every morning during the summer. June 25, 2009. "He was scaring me for a little while," said Snipes. "He is constantly putting up great stuff, and he did a great job this year." Darryl Dyck, a freelance photographer from Vancouver, Canada, won third place and a Canon EOS 50D camera with an EF 28-135 IS USM lens. Snipes, having won this contest three times, also won the 2006 SportsShooter.com Student Photographer of the Year contest. He is no stranger to entering, and winning contests. His tactic? Don't give up. "Every month you've got to keep submitting," he said. "It's a year-long competition, not a sprint. It's important to keep pushing yourself each month." The 2010 SportsShooter.com Monthly Clip Contest will also mark the first time that students will be competing side-by-side with the rest of the membership. Confirmed full-time students who enter the clip contest will have their votes counted in an additional "student contest." At the end of the year, the student with the most points in the Monthly Clip Contest will with a Canon EOS 5D Mark II digital camera. As a result, the original SportsShooter.com Student Portfolio of the Year contest will end when the panel of judges select the 2009 winning portfolio. The winner of that contest will also receive a Canon EOS 5D Mark II. "We decided to make it easier for students to enter the contest," said Grover Sanschagrin, Executive Producer of SportsShooter.com. "The old method involved entering a full portfolio, and then entering a week's-worth of work each month, which proved to be too difficult a process for many students. With this change, we will be able to involve more students, and they'll be able to compete against seasoned professionals in addition to other students." Canon has agreed to continue their support of the 2010 Monthly Clip Contest, and supply high-end professional equipment to the winners. "Canon has been a steady, enthusiastic supporter of the SportsShooter.com community," said Sanschagrin. "These prizes are highly coveted professional workhorses, and we're proud to be able to provide such impressive prizes to the winners."